Our dear customers, the Olympic Games in Rio de Janeiro are coming very soon. This is a grand event and it is a great honor for each gymnast to take part in it. 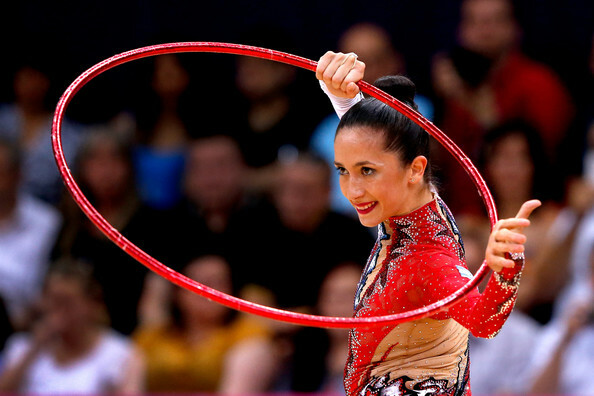 Neta Rivkin is an Israeli rhythmic gymnast who will definitely perform at the Olympics. This is going to be her third Olympic Games. What does she think about it? You may find it out in this article! The harder your way is, the greater your delight with victory will be. My way to the victories and to the person that I have become was very complicated. These words of the most popular Israel’s rhythmic gymnast, Neta Rivkin, describe her whole life. We will tell about the things that are hidden behind the plain words “hard way” that led her to success. 7. Neta has been training from 8 to 10 hours every day for 15 years already. She has only one day off a week. I got acquainted with Ella 20 years ago. I haven’t left sport hall since that time. I found myself in gymnastics. At different ages I always found new motivations and new challenges for me. When I was 6, I liked ribbons, balls, dresses – everything that is beautiful and shining and connected with gymnastics. Coaches knew that I would achieve a lot. They defined it according to the type of my body, character and personality. They were sure that it would happen not at once. I would need a lot more time than other gymnasts do. And so it happened. The first serious results I showed when I was 12. Having felt that I could do a lot, I decided that I must train not 4 but 8 hours a day. At 15 I felt that it is possible for me to get to the Olympic Games in 2008 and I did everything to pass all criteria. Today I can say that the hardest thing is not to achieve medals but to keep the level you achieved. The more you achieve, the harder it is to maintain the leading positions. That’s why it is so important and priceless for me that I’m among the best gymnasts of the world for 8 years. Not long ago it was considered to be impossible. The Brazilian Olympiad will be third in my career. And, of course, thanks to gymnastics I found a close and important person in my life – my coach, Ella Samofalov. She saw me growing up. She knows me best of all and she does everything to let me succeed. The price of the victories. Trainings mean pain, injuries and overcoming of yourself. They mean to move farther when you think that you can’t. But I get a great inspiration when I train in the sport hall. This feeling gives me energy and makes everything be full of sense. I feel that I was meant to do gymnastics. I do it best of all. I’m appreciated in the world of gymnastics. I’m supported by the fans. They give me stimulus and motivation. I have to refuse from many things. Sport takes the first place, all other things take the second and the third ones. But I perfectly understand that I have all the main things. Everything that I miss, I’ll catch up. Olympic pieces of advice from Neta Rivkin. - I advise to all mothers to take their daughters to rhythmic gymnastics. They should do it not to make champions from their children but to let them form a sport character: responsibility, concentration, ability to aim and to move towards their goals, self-discipline and a good physical form. - A psychological form is no less important. With experience gymnasts also acquire an experience of overcoming stress – and there is nothing comparable with the Olympic stress. To keep balance and the Olympic calmness in life you need to have harmony inside. That’s why you need to feel great inside, to understand that you are at the right place, with right people and that you do your business. - Always do maximum out of what you can – in any situations, whatever you do. Remember that no miracles are possible. There is an honest reward for your efforts. “Sport happiness” is said to exist. But my experience shows that there is no luck in sport. Success comes as a reward for everything that you gave for it. - Get energy from things that inspire you. Inspiration gives you an incomparable feeling for the sake of which a person can do everything that he hasn’t suspected that he can do. Everyone has his or her own inspiration. It can be found in music, in gardening or by following the idols. - Don’t be afraid of difficulties that you’ll meet on your way. The harder your way is, the greater your delight from results will be.